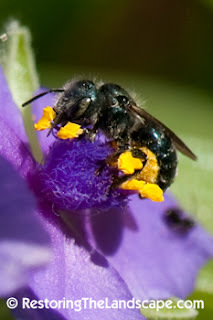 Restoring The Landscape With Native Plants: Native Bee Spotlight: Mason Bees ~ Osmia spp. 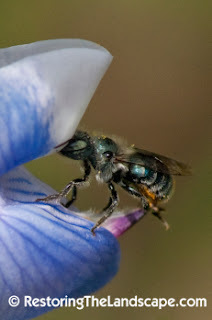 Native Bee Spotlight: Mason Bees ~ Osmia spp. 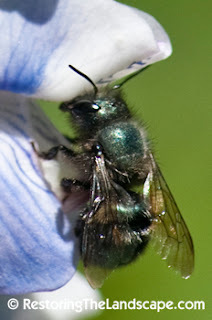 Mason Bees ~ Osmia spp. 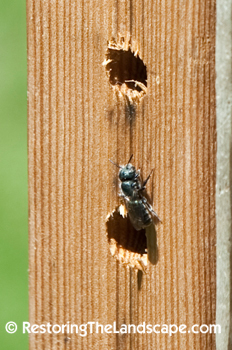 Mason Bees were one of the first native bees we knew were nesting in our landscape because we provided bee boards for them. They will nest in many types of natural cavities such as under rocks, behind bark or in the pithy stems of plants. Mason Bees are a small to medium sized bee, with a blue/green metallic body which is moderately hairy. There are many types of cavity nests that you can create, simply drilling holes in an untreated wood block and hanging it in a sunny location works well. We started with some holes drilled in the end of a 2x4 board (maximizing the hole depth). For the first couple of years, we had a lot of Mason Bee activity. We have since made simple wood holders out of plywood that are stuffed with hollow plant stems (Cup Plant, Pale Indian Plantain). Stems can be changed out every two years (after the adult bees emerge in spring). This ensures that you are providing clean nesting cavities. Females collect pollen and nectar, combine the two ingredients forming a bee bread. They deposit the bee bread at the back of the cavity, lay a single egg on it where the larva will develop and consume the bee bread. She repeats the process of depositing bee bread in the cavity, walling off each section creating separate brood compartments. We start to see these bees active in early spring, visiting Wild Geranium (Geranium maculatum) flowers in May. 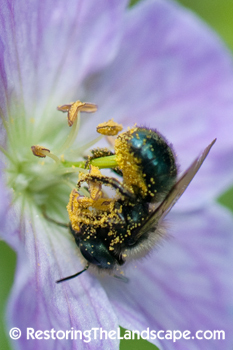 Females collect pollen on their abdomen as illustrated in this photo. 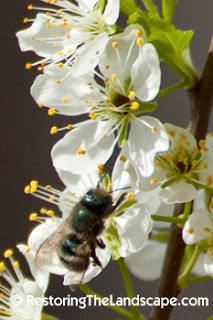 They also love our American Plum (Prunus americana) tree which is extremely fragrant and a great pollinator plant. Mason Bees are being used as alternative pollinators of commercial crops. They have been fairly successful in filling voids left by honey bees for almond tree pollination in California. These medium sized bees seem surprisingly strong, able to pry open the Wild Lupine (Lupinus perennis) flowers to access the rewards offered. We see the last adults in early June visiting the Ohio Spiderwort (Tradescantia ohiensis) flowers. 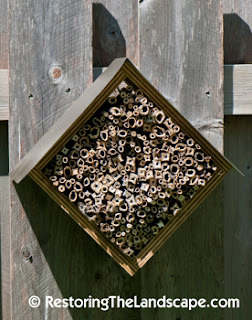 There's lots of resources online on how to build Mason Bee houses, and some very creative examples. A Mason Bee house is a great holiday gift idea for the wildlife gardener.